BEIJING — China on Wednesday sentenced a veteran pro-democracy campaigner to 13 years in prison on vaguely defined subversion charges, one day after releasing the widow of a Nobel Peace Prize laureate after eight years of house arrest. The People's Intermediate Court in the central city of Wuhan announced the sentencing of Qin Yongmin, whose activism dates back four decades, on its official website Wednesday. No further details were given and it was not immediately clear who was representing Qin in court. On Tuesday, authorities allowed Liu Xia, wife of the late Nobel Prize winner Liu Xiaobo, to depart for Germany in response to what the Chinese Foreign Ministry called her own request to receive medical treatment. Liu had been held under house arrest since late 2010. Coming during a visit by China's Premier Li Keqiang to Germany, Liu's release heartened foreign governments and human rights campaigners, who pointed out that she had never been charged with or convicted of any crime. Qin's sentencing, however, underscores China's hard line against anyone challenging the ruling Communist Party, which under leader Xi Jinping has launched the most sweeping crackdown on civil rights in years. Having already spent more than two decades in detention, Qin was arrested most recently in 2015 but not tried until May this year. The 64-year-old became active in the pro-democracy movement in the late 1970s during a time of political opening, and was arrested for the first time in 1981 in the ensuing Communist Party crackdown on dissent, according to the group Chinese Human Rights Defenders. Reached by phone, Qin's former lawyer, Ma Lianshun, called the ruling "completely illegal" and a violation of the constitution's guarantee of the right to free speech. He said the charges appeared to relate to writings Qin had posted online and published outside China. "It is not a criminal activity. He was discussing the road that China can take and the corresponding methodology, which is within the boundary of his right to speech," Ma said. Ma said his firm ceased representing Qin on July 10, 2017, due to the sensitivity of his case. A three-year campaign against legal activists that landed scores in detention has frightened many lawyers from taking on such causes. 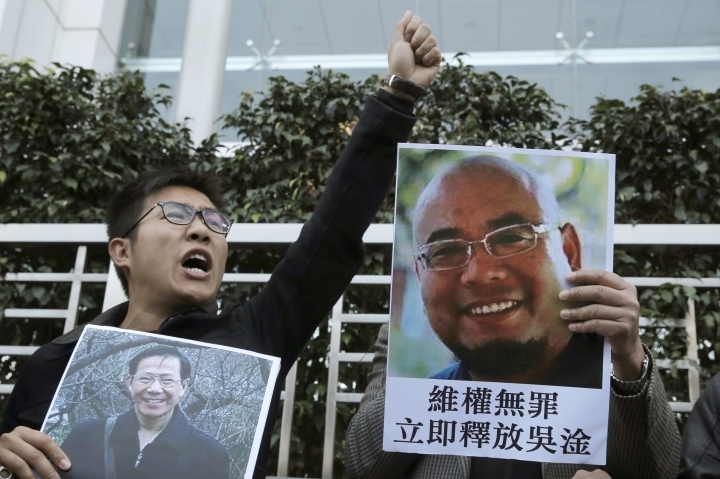 His sentence is "a reminder that Xi Jinping's brutal crackdown on human rights continues," said Frances Eve, a researcher with Chinese Human Rights Defenders. Authorities denied Qin a fair trial, Eve said, proceeding with a hearing in May despite the man's poor health. "The litany of abuses in his case, ranging from enforced disappearance, prolonged pre-trial detention, collective punishment of his wife, ill-treatment, and denied due process rights reinforces that there is still no rule of law in China," Eve said. Qin's sentence also comes just a day after the EU and China concluded a human rights dialogue. In a statement sent Wednesday, the EU said that during the two-day talks, it emphasized the "deteriorating situation of civil and political rights in China, which has been accompanied by the detention and conviction of a significant number of Chinese human rights defenders." Also Wednesday, the director of China's most prominent independent economic research group said it has been evicted from an apartment it used as an office. The Unirule Institute of Economics, which advocates for market-style economics and constitutional democracy, has been repeatedly harassed by communist authorities. Its website and social media accounts were shut down in January. On Tuesday, Unirule's landlord locked its employees out of the apartment even though the group has a lease through 2020, said Sheng Hong. He said the landlord has been demanding the group move out, but he suspected Chinese authorities were behind the pressure. "It might be that some Chinese ideology departments don't like our views and research," said Sheng, who co-founded Unirule in 1993. "It is fine for them to dislike our articles and studies, but there should be different voices in society and it is supposed to be protected by the constitution." The group has published reports that say major Chinese state-owned companies are unprofitable and receive large public subsidies. Unirule has also championed freedom of expression and due process and conducted symposiums on sensitive subjects such as the Chinese civil war that brought the communists to power in 1949. "Never before has Unirule been so alone in its fight for liberty in China, and the rule of law so jeopardized by the authorities that ordered such heinous act," said a statement on the group's Twitter account.